Sean Kelly Gallery is pleased to announce an exhibition by Julião Sarmento featuring new paintings, works on paper, and a slide projection installation, which is a collaboration with Arto Lindsay. Sarmento's exhibition is comprised of a number of new works under the collective title Domestic Isolation, which deal with issues of complex interpersonal relationships. This is Sarmento's first exhibition of new paintings that represent a significant shift of stylistic intent. 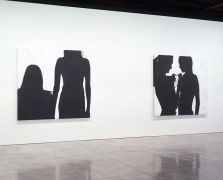 The new paintings no longer focus on line as representation of female form, but utilize monochrome silhouettes to represent the figures. Each of the paintings features the silhouettes of two women, different characters in an apparently unfolding domestic drama. Sarmento revisits the familiar iconography of his paintings, sculpture and film pieces, that have consistently informed his oeuvre and continues to explore themes of psychological interaction, sensuality, and voyeurism. Flashback, a collaboration with musician Arto Lindsay, is a slide installation with a soundtrack by Lindsay. Drawn from films, magazines, advertising, novels and daily life, Sarmento's collection and formulation of images become a reflection of his artistic and personal life much like a visual diary. The images in Flashback evoke strong connections to the mundane world of the snapshot, but also reveal a realm of unconscious beauty, voyeurism, sensuality and fetishism in apparently everyday images. Julião Sarmento was born in Lisbon in 1948. He has exhibited extensively worldwide since 1979. Sarmento has been included in two Documentas and two Venice Biennales. His work is represented in public and private collections worldwide such as: The Hirshhorn Museum and Sculpture Garden, Washington, D.C.; the San Francisco Museum of Modern Art, San Francisco; The Solomon R. Guggenheim Museum, New York; The Museum of Modern Art, New York; the Musée National d'Art Moderne Centre Georges Pompidou, Paris, France; the Stedelijk Van Abbemuseum, Eindhoven, Holland; and the Hara Museum of Contemporary Art, Tokyo, Japan. Sarmento is one of the six senior artists invited to exhibit in the XXV Bienal de São Paulo: Iconografias Metropolitanas, São Paulo, Brazil, which opens in March 2002. His forthcoming solo exhibitions include the Stedelijk VanAbbemuseum, Eindhoven, Holland and Julião Sarmento: Photoworks from the Seventies, Museu do Chiado, Lisbon, Portugal. Sarmento's work has been selected for several upcoming museum group exhibitions including: Something is Missing, Museu Serralves, Porto, Portugal; and Conversation? Recent Acquisitions of the Van Abbemuseum, the Van Abbemuseum, Eindhoven, Holland.